Maker events celebrate doing. Fusing art, science, education, and imagination, they bring together authors and environmentalists, builders and ‘bots, cooks and crafters, hackers and horticulturalists– people who engage in and solve the world’s problems through creativity and collaboration. When the Toms River Regional Schools superintendent and board approved the creation of the first Jersey Shore Makerfest in October 2015, it kicked off a 10-month process of cooperation, inspiration, and coordination. With 19 educational facilities, 2,470 staff, 16,000 students, and many needs, Toms River is a study in organizational management. 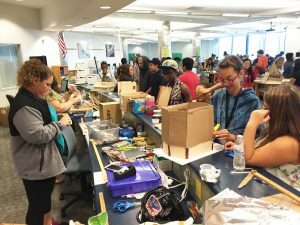 Now in its third year, Makerfest has helped bring a STEAM mindset to the entire community– parents, N.J. school districts, colleges, community organizations, museums, tech companies, local artists, the NJDOE’s Office of Educational Technology, and NJSBA. Contact the district for support and guidance on hosting a Makerfest.